One of the highest-paid centers in the NFL walked away from football at the peak of his career. 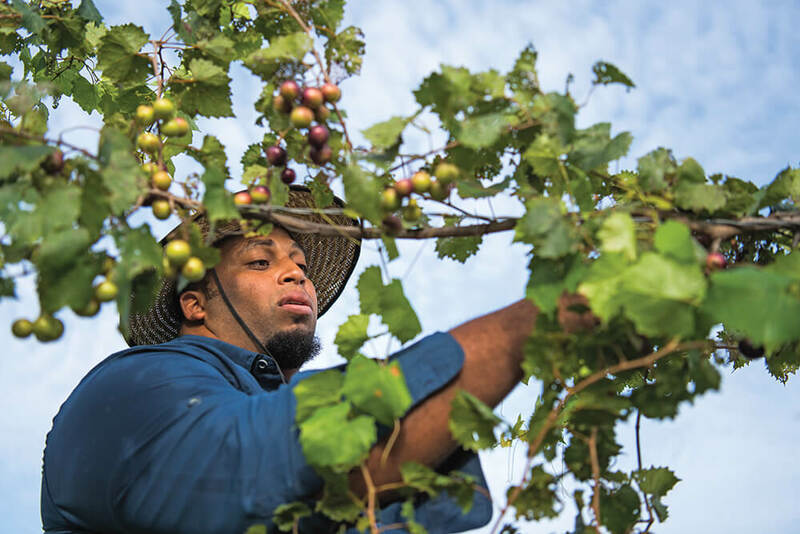 His new life on a farm in Louisburg, just 30 minutes from where he grew up, was much harder, and happier, than he ever thought possible. It was the off-season, but Jason Brown felt exhausted. He sat on the edge of the bed, held his head in his hands, and prayed. God, what do you want me to do with my life? He wasn’t prepared for the answer he got. Jason stood up, tried to walk it off, and caught a glimpse of a face in his bathroom mirror — a face that was not quite his own. It had the same coloring, the same nose, and even the right hairline, but somehow it was a little leaner. It was Deucey, his older brother. Deucey’s real name was Lunsford Bernard Brown II, and he was dead, killed during a mortar attack in Iraq back in 2003, saving 11 other soldiers from the shrapnel that might’ve killed them, too. Deucey was 27 years, 7 months, and 10 days old when he died. Now, it was Jason’s 27th birthday. It was 2010, and the door to play professional football was still open for him, but football wasn’t a calling. It was a job. There was an emptiness to it, one Jason tried to fill by buying a 12,000-square-foot house for his growing family and filling it with things: a television in each room and memorabilia from his career, reminders that, to outsiders, he’d made enough money to achieve the American Dream. He was, at one time, the highest-paid center in the National Football League, after signing a five-year, $37.5 million contract with the St. Louis Rams in 2009. He’d always been good at football. He’d been a standout offensive lineman at Northern Vance High School and at UNC-Chapel Hill, where he was known as a striking space-eater in Carolina blue and white. But in 2011, Jason had a setback. The Rams took away his job as a starter. After the season, the team released him. But before all of that, Jason already knew he wanted to get back home, to the land he was raised on. He needed to remember the things he’d loved before he started playing this game for money. For most of his life, Jason Brown and his family believed in the three pillars of the American South: Faith, Family, and Football. After 2012, the last F changed. Jason is having muscadines for breakfast, fresh off the vine. He bends his 6-foot-3, 320-pound body into unimaginable shapes, combing through the vines with incredible speed for his size, a remnant of his former life. He plops the good grapes into a bowl and eats them as he explains how all of this came to be. Jason, his wife, Tay, and their six kids live in Louisburg on a 1,000-acre parcel of pasture and farmland. It’s 30 minutes from Henderson, where Jason grew up, and where his parents still live. 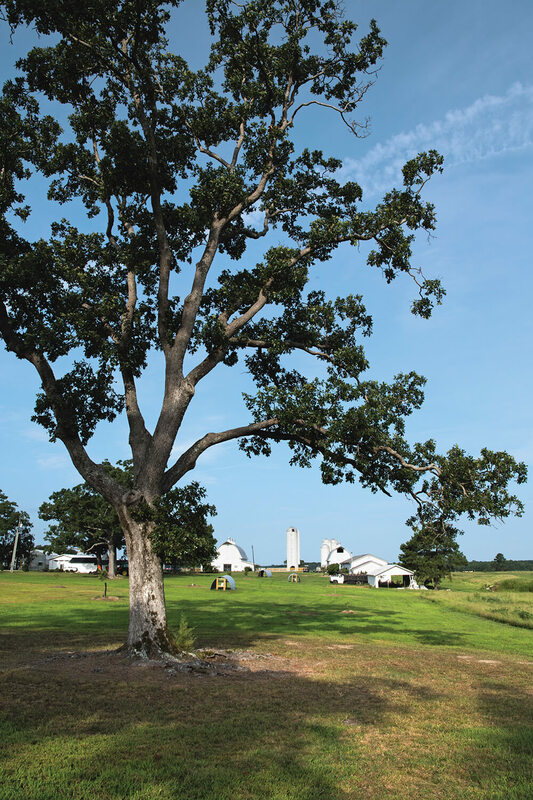 The property’s been a farm for more than 100 years, and the big white barn where cows were once milked stands silhouetted like an angel against a Carolina blue sky. It hurts him to think that somebody might be hungry right down the road or across the county line, so he gets on his baby blue Ford tractor to take care of the weeds, inspired to make the most of the day before the sun goes down. He’s seen the way hunger can shape a home. He’s read about the 200,000 children in North Carolina who are never sure where their next meal is coming from. He’s witnessed the telltale signs in the eyes of kids in his hometown. He wanted to feel a little less helpless. So he was compelled to become a farmer, and to give away part of his crop to help. Jason’s working harder than he ever has, but he goes to bed with a peace of mind he’s never had before. Nobody owns him anymore, he says. Many fans who bought tickets to see him play treated him like they’d paid for a piece of his soul, expecting unfettered access to his personal life. In fact, everything about his past life, as he sees it, was virtual — all the screens, phones, tablets, televisions, social media, and video games. On his farm in Louisburg, he’s away from it all, no longer part of a sports team, spending his days in quiet atonement for his time in the spotlight. Jason doesn’t watch football much anymore. There’s one TV in the entire farmhouse. It stays off for weeks at a time. This is his fifth year on the farm, and a lot of people didn’t think he’d last this long. They thought he’d get tired of the novelty and worn down by the monotony. But the private life of a farmer and the private life of a football player are not that different. Both require extreme discipline and the ability to think on your feet. Still, most people have a hard time understanding how Jason could leave football behind to embrace a way of life he knew nothing about. Even now, people ask him: Why did you do it? Jason looks down into his bowl, half full of muscadines, unsure of what to say next. After breakfast, Jason eases his bulk into his black pickup truck and begins to trace the perimeter of his farm, heading toward the Tar River. His eyes constantly scan the land for changes, stopping short when he sees something different. “It isn’t supposed to be doing that yet,” he says under his breath. A skinny sapling, no bigger than a stick, has a cluster of mature pecans on it, bearing fruit almost two years before it should. Jason’s time on the farm has been like that — a series of little miracles, way ahead of schedule. In year one, First Fruits Farm grew five acres of sweet potatoes, their lush green vines snaking along the fence, heart-shaped leaves hiding the orange-fleshed gems underneath. Now he’s up to 15 acres. 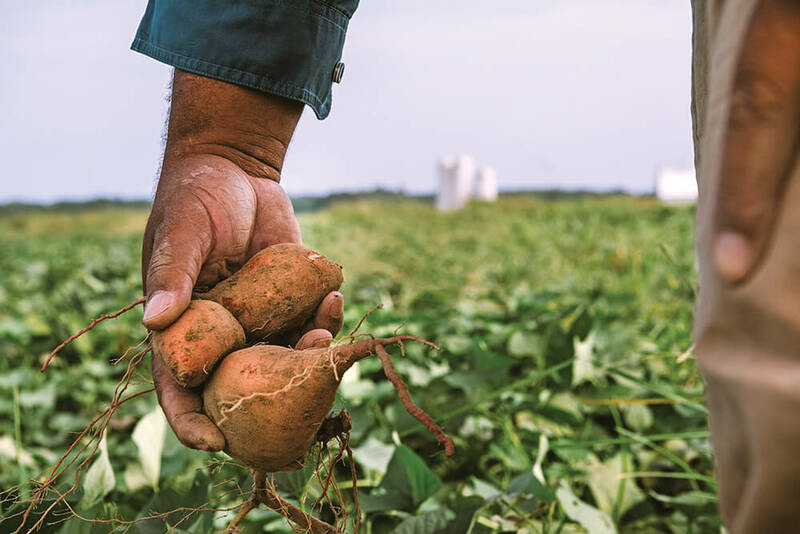 If all goes according to plan, this year’s harvest will reap 300,000 pounds of sweet potatoes. Some days he wonders what Deucey would think of all this. He sometimes imagines what it’d be like if his brother were here with him, working by his side. Out in the field Jason bends like he’s going to snap a football, but instead brings up a cluster of the sweet potatoes, turning them over in his hands, soil the color of brown sugar falling onto his boots. This is just a preview, he explains. The rest of the sweet potatoes will be harvested a little later with the help of volunteers from the Society of St. Andrew, and then loaded onto trucks from the Food Bank of Central & Eastern North Carolina. Once the vegetables are bagged, they’ll make their way into 800-plus food pantries and after-school programs, boosting Jason’s message, spreading the gospel one bag of sweet potatoes at a time. Not bad for a man who says that, some days, he still doesn’t know what he’s doing. The first lesson Jason had to learn was that he couldn’t do it by himself, and that farming, like football, is a team game. Back in the beginning, as Jason’s neighbor Len Wester planted his tobacco on the next farm over, he could see Jason up on a nearby hill. Jason was driving a tomato-red hand-me-down dinosaur of a tractor, trying to make a good run of it, kicking up dust as he swept up and down the rows. Len is a large-scale farmer, and he knew Jason’s farm better than Jason did — he’d had an arrangement with the folks who’d owned the place before. He knew of Jason’s plan to grow several acres of sweet potatoes, just to turn around and give them away. The football player’s heart was in the right place, but he had no idea what he was doing. Weakening under the noonday sun, shorthanded with aging machinery, and unprepared for attacks from swarms of mayflies, Jason bushhogged the best he could, turning in circles on the tractor till dark. The next day, Len told Jason to meet him on the highest hill of Jason’s farm. Once there, both men looked down. Jason’s field was plowed. The sweet potato slips were packed, waiting to be planted. Len had saved Jason from himself. “It’s a pride thing,” Jason says. Up until then, he’d been trying to learn how to farm by watching YouTube videos. He’d been afraid to ask for help because, in Jason’s words, he didn’t want to look like “a dumb jock.” And then, Len came over. Sometimes, the Lord sends you a little help. 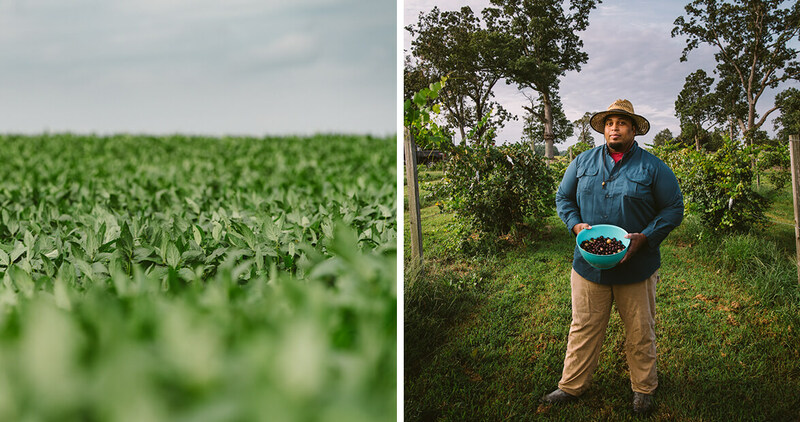 Latria Graham is a fifth-generation farmer and writer based in Spartanburg, South Carolina. 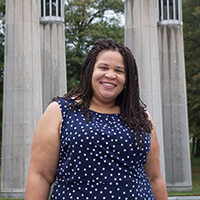 Her work has appeared in espnW, The Guardian, and other outlets.